Cabled Feather Cowl, Feathered Cable Cowl ? I can't seem to keep the name of this gem of a pattern straight--Cabled Feather Cowl, Feathered Cable Cowl--hells bells, which is it? Not quite sure, but it was a sweet little project, that's for sure. I was feeling the need to do a small accessory, just to remind myself what the whole 'finishing a project' alien concept felt like. Verdict: Nice, it feels...unfamiliar yet nice. 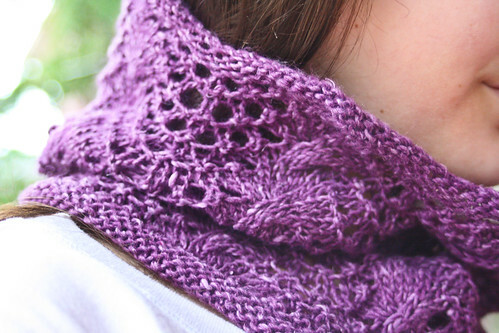 Mods: I opted to do only 6 repeats as I prefer cowls that stay down around the neck. Trying to avoid the Bazooka Joe look. Time: About a week of on & off knitting. It's a winner! This is the perfect time of year for this type of garment--there's just enough of a chill in the air to make it the perfect little extra layer. Can't wait to wear it this week as the purple is so seasonally appropriate. And those of you who have read this blog know that it's not a color that is unwelcome round these parts. A word about the yarn. This was the first time that I ever had the pleasure to work with Maiko, a yarn which I greedily nabbed off the 30% discount table at Knit One. Apparently the Noro solids don't sell well there, so their loss was my gain. Imagine if Cash Iroha weren't slubby--that is Maiko. Peeping around Ravelry, I see that it doesn't seem to have caught on like the rest of the Noro yarns, it is perhaps too simple and plain to catapult it onto center stage, thereby making it the Jan Brady of the Noro family: unappreciated. 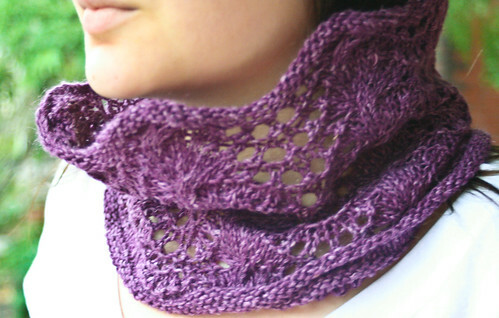 Normally I would be reaching for the air sickness bag at any pattern that had cables, lace and a feather & fan design, but this pattern somehow makes it work and doesn't veer into the overly busy. 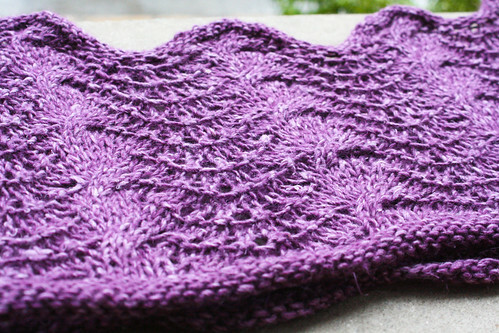 Cabled Feather Cowl: it's not puketastic. A ringing endorsement if ever there were one, right? The past week I have been doing some top-secret knitting with a yarn to which I have taken a Promise Keeper's monogamy pledge: Felted Tweed. I am seriously crushing on this yarn and have fallen hard for it. This isn't the first time I've used it but WOW am I having a hard time coming up with good reasons to ever knit with another yarn again. Aren't those colors kind of amazing together? I am knitting a Drive-Thru for a friend that just adopted an 18 month old. I made the pull-over before and am now trying my hand at the cardigan. The purling will likely cause me to bug, but I am trying a brand new gimmicky set of square needles--the Kollage needles--and I gotta say, they are unbelievably light and are thus making the job go that much quicker. 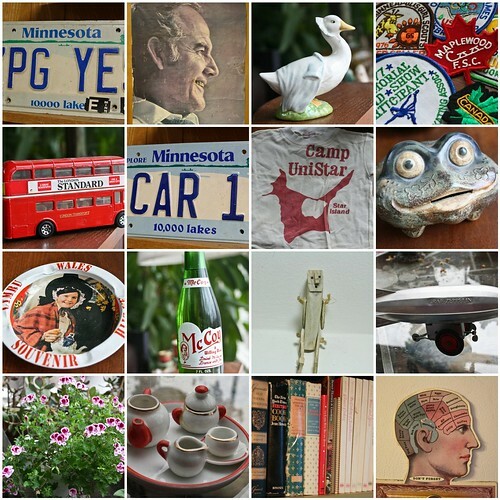 Meet-ups, contests & projects, oh my! 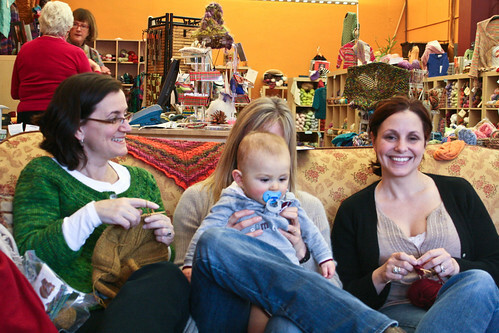 First up: Knitting with Keana and Leslie! Babs and I took our Central PA. show on the road and finally had our much anticipated meet-up with Keana and Leslie at Knit One in Pittsburgh. We had such.a.blast. Keana and Leslie are pretty much what you'd expect: super friendly (heh), gracious and lovely. Next: Super Nifty Sock Designing Contest! 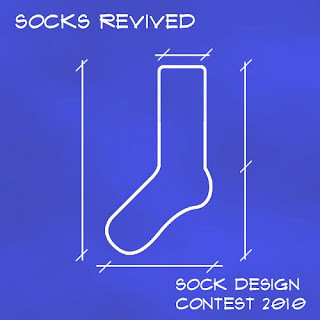 This event, the Reviving Socks Design Contest, promises to be a rollicking good time. The mighty Elinor has spent much time and care putting together what promises to be a flat out amazing sock designing extravaganza. You've probably got a design or two just waiting for a reason to see the light of day. This is your chance! The rules are quite easy to follow, the creative feedback you'll get will be priceless and the prizes are unreal. I'm mean, it's Elinor. So it's quality. If you check out the list of judges, you'll see that yours truly will be there, too. Judging you. But in a totally non-mean, non-judgy, supportive way! It'll be fun! Help me love socks again. Keep me away from Costco buying more of these.